The College of Agriculture, Forestry, and Natural Resource Management (CAFNRM) is part of the University of Hawaiʻi at Hilo. It is located on the Big Island of Hawaiʻi, the largest island in the Hawaiian Archipelago. Situated in the Pacific Ocean, Hawaiʻi Island is about 4000 kilometers (2500 miles) from the mainland U.S.A. Hilo, which has a major harbor and an international airport, is home to about 45,000 people and is located about 320 kilometers (200 miles) from Honolulu, the capital of the State of Hawaiʻi. The island economy is centered mainly on agriculture and tourism. The College opened its doors in the fall of 1975 with the main objective to prepare students for a broad and full understanding of basic factors involved in production, management, processing, distribution, marketing, sales, and services in the field of agricultural sciences. To achieve this goal, CAFNRM offers the Bachelor of Science degree (BS) in four areas of specialization: Animal Science (which includes a production option and a pre-veterinary option); Aquaculture; Tropical Horticulture, and Tropical Plant Science & Agroecology. To provide a well-balanced education, a good portion of a typical curriculum consists of College of Arts and Sciences courses as well as CAFNRM courses. CAFNRM also offers academic subject certificates for baccalaureate degree seeking students and non-degree seeking students: A Forest Resource Management & Conservation Certificate and a Plant Tissue Culture Certificate (see under "Courses"). In order to prepare students for immediate careers in agriculture, as well as further graduate study, the program blends comprehensive classroom instruction with practical, technology-based education through use of the University of Hawaiʻi at Hilo Agricultural Farm Laboratory. 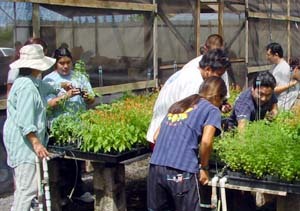 On 110 acres in Panaʻewa, five miles south of the main campus, students can experience putting theory into practice with hands-on learning in various enterprises such as anthuriums, ornamental foliage, hydroponics, floriculture plants, orchids, forestry, vegetables, sustainable agriculture, livestock production, equine science, beekeeping, tropical fruit, and aquaculture. In addition, Hilo’s location in the center of a large farming community offers opportunities for field trips to diversified agriculture and aquaculture enterprises. On campus, CAFNRM offers excellent facilities for students in agricultural science. The agriculture building provides classroom and laboratories for courses in horticulture, animal science, entomology, plant pathology, tissue culture, soil science, agronomy, aquaculture, crop production, and agribusiness. Students can also utilize the laboratories and greenhouses on campus for special projects in directed research courses. A well-equipped microcomputer laboratory is also available for student use. All CAFNRM students are invited to participate in the Agriculture Club. This is a student organization that promotes agriculture, food security and sustainability through education and service in the community. The U.S. Department of Agriculture (USDA) projects strong employment opportunities for college graduates in the food, agricultural, and natural resources system in the United States. The report with employment projections for 2005-2010, based on a national study, is available from the University of Vermont . This data is useful for college students interested in pursuing careers in agriculture and natural resources.